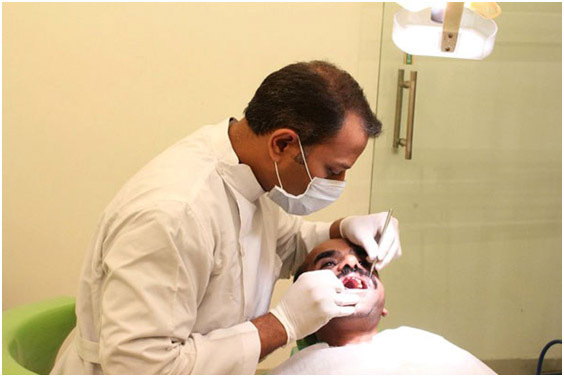 Dr Utkarsha Lokesh is the top dentist in Bangalore. Utkarsha Dental Care is the top dental clinic. Cosmetic dentistry is dedicated to create and spread the aesthetically pleasing smile. Your cosmetic dentist can whiten teeth, replace missing teeth, and repair chipped teeth through a variety of cosmetic options like tooth bleaching, porcelain veneers, dental implants, bonding, dental crowns, and bridges. Next time if you wonder at the smile of your favorite movie star, most like it’s the handiwork of a cosmetic dentist. Do I need a smile correction? You are getting that feeling that there is something missing in your smile! A diastema is a space between front teeth. Diastemas are closed by orthodontics or restoration. A highly successful technique is addition of composite. A space which is too large and closed with composite results in teeth that are esthetically too wide and orthodontics is recommended. Space closure requires placement of composite to two adjacent teeth. Placement of composite onto one tooth can be done if proper tooth dimensions allow it. Like its name suggests, enamel shaping refers to the process of contouring natural teeth to achieve better appearance. It can be employed to adjust the slight irregular shape caused by too many or uneven teeth. A porcelain veneer is a thin shell of porcelain that is bonded onto the front surface of a tooth so to improve its cosmetic appearance. If you already have crowns on your front teeth, replacement with all porcelain jacket crowns may give you a more natural, attractive appearance. Or think about cosmetic repositioning as an alternative to orthodontics with the placement of porcelain veneers. They are often used to fix gaps between teeth, or cover stained or irregular teeth. This procedure is usually not reversible because a very thin surface of enamel is removed to give room for the shells. All Porcelain Crowns can provide the same sort of major cosmetic changes that porcelain veneers can make. However, unlike porcelain veneers that only cover over the front sides of teeth, All Porcelain Crowns cup over and encase the entire aspect of a tooth which lies above the gum line. Teeth jewellery is a brilliant way to add sparkles to your smile and stand out of the crowd. Getting Teeth jewellery is a painless procedure where your dentist will fix the jewel on your teeth. Look for dental jewellery which is certified by a reputed agency, you will also get colors to choose from. Dental Jewellery can be removed at will without any side effects on the dental tooth structure as the procedure is non-invasive. What’s more, tooth jewellery can be fixed again at a later stage. The jewel will be a fashion statement and will not damage tooth tissues and has no side effects – except for the charm and attention! 1) Smoking or Tobacco Chewing. 2) Excess Tea, Coffee, Cola’s and Red Wine. 3) Antibiotics such as Tetracycline (Black Teeth) or chloramphenicol (Yellow Teeth) taken at a very young age. 4) Excess of Fluoride in drinking water. 5) Age causes natural darkening of teeth. 6) Dental Infection, old mis-match fillings and a tooth treated for Root Canal. 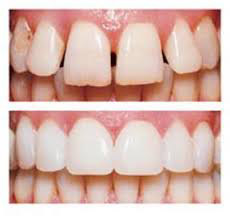 Bleaching is a simple procedure where the bleaching agent(Hydrogen peroxide) are applied on the teeth which in turn removes the external and internal stains and thus making the teeth a shade better than existing. 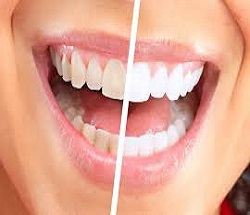 Office Bleach: First teeth cleaning & polishing is done, then your gums & lips are covered by a protecting gel and then the bleaching agent is applied on the teeth, waited for some time and then a special light is exposed on the teeth. This is done for about 3 to 4 times in an hour or in 3 to 4 sittings, making the teeth whiter than before. Home Bleach: After teeth cleaning & polishing is done, your upper and lower teeth impression (measurement) is taken and sent to the lab for making the soft bleaching (Vulcanized Rubber) Trays. Next day the Trays and the bleaching agent (gel) are given to you & the procedure to put the gel in the Trays & to wear it is explained to you. No Side effects are caused by any of the bleaching procedures. Some patients my experience discomfort or sensitivity for few days which goes away in 2-3 days after treatment is stopped. Till that time, either use desensitizing mouth washes & tooth paste or decrease the number of hours each day or do the bleaching procedure at a gap of 2 or 3 days instead of everyday. What are the Post Treatment Care? Refrain yourself from the factors mentioned above leading to teeth discoloration. Proper and regular brushing is compulsory. Regular once yearly check-up and teeth cleaning (if required) should be done. Regular touch up sessions can be carried out once a year to maintain whiter teeth for a longer period. To be widely recognized as one of the world's leading dental providers. To offer comprehensive, customized and comfortable dental treatments within a relaxing and soothing ambience utilizing the world's leading diagnostic, sterilization and treatment technology that dramatically improve our patients' oral health and overall well-being. To offer the highest quality of care and convenience for our dear patients. In addition to General Dentistry, Cosmetic Dentistry and implant dentistry remain at the heart of our practice. Our interdisciplinary team of experts provides specialized services and innovative solutions in all areas from Orthodontics and Oral Surgery to Prosthodontics and Periodontics in ONE convenient location.